Kustomvape only this week announced the arrival of its own CBD eliquid range. John Dickson immediately started selling the Hemp Oil in Glasgow centre. 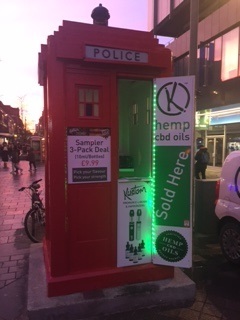 John Dickson stated “I think there is a little irony in selling Hemp Oil from our Police Box, however, unlike illegal Hemp, CBD eliquids are believed to have many medical benefits. I have already had a number of individuals tell me how our CBD is helping them with the particular ailment”. Kustomvape delivers its CBD Hemp oil as an e liquid and is vaped using an ecig vaporiser, Kustoms premium CBD contains no nicotine and comes in 5 flavours initially including tropical, grape, berries, fruity and menthol. The CBD is created from pharmaceutical grade Hemp Oil, and Kustomvape has its products manufactured in the USA with the all the other ingredients sourced from within the USA to ensure the highest quality product possible. Kustomvape offer a number of exciting flavours from their extremely popular Watermelon Chill, Tobacco, Pink Lemonade, Strawberry, Vanilla, Banana Nut, Fruity and many more. However, recently Kustomvape launched a development program supported by a competition to ask for suggestions for a new flavour. The winner will receive a weekend break to New York, the competition is still open and no purchase is necessary. Kustomvape is a Scottish company based in Edinburgh who consider themselves different to other e-liquid companies. Providing only premium e-liquids, the Kustomvape portfolio includes prestigious vaporizers and accessories. Kustomvape products are available online and at over 500 retail locations throughout Scotland. With over 700 stores selling Kustom eliquids the popularity of their products is very clear, Kustomvape now have customers from all over the world.